It was the shot that changed Cameron Smith's life. 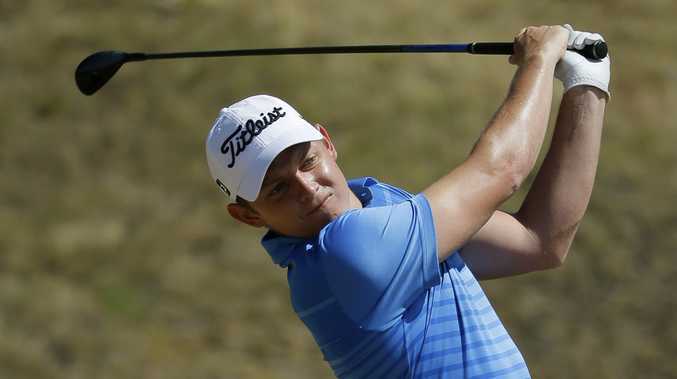 The only Aussie out of 21 hopefuls who won through qualifying to earn a place in the US Open, the young Queenslander drilled a 265m three wood to the 18th green at Chambers Bay and watched it curl around the tiered green to within 30cm of the flag in the final round. The tap-in eagle not only secured him a share of fourth with last week's Presidents Cup teammates Adam Scott and Branden Grace, it also earned him a start in next year's Masters and US Open. On top of that, the result helped the 22-year-od finish the season ranked 95 in the world, as well as pocketing a lazy $A1.350 million from his 13 events, all played as a non-PGA Tour member. That ensured he won't have to worry about getting invitations to play in the 2015-16 season which kicks off with the $8.29 million Frys.com Open in California tonight. Smith, one of 10 Aussies in the field for the tournament, said he had one person to thank for getting him the opportunity to play on the big stage - PGA winner Jason Day. "Jason helped me out all this year just with getting spots and putting in a good word for me," he told APN. Getting the starts is one thing, turning them into results is another. And Smith said his finish at the US Open - where he was the only player in the field to shoot par or better in each of the four rounds - convinced him he could compete with the best players in the world. "I love the big moments," he said. "It (the eagle on 18) gave me heaps of confidence. "Just to know that you belong out here I think is a massive thing." Smith has been given an early-morning tee time for the season-opener, where much of the attention will centre on the group behind him - that trio consisting of world No.3 Rory McIlroy, 2013 US Open winner Justin Rose and 2012 FedEx Cup champion Brandt Snedeker. The nine other Australian players in the field are: Geoff Ogilvy, John Senden, Robert Allenby, Aaron Baddeley, Jarrod Lyle, Steven Bowditch, Matt Jones, Stuart Appleby and Rhein Gibson. Of that group, Allenby is playing on a prizemoney exemption, Appleby and Lyle on medical exemptions. Baddeley has been given a start as a previous PGA Tour winner.